Personally, I’m not that excited about turkey. I wanted a Thanksgiving salmon, but that got shot down immediately. I’m just thankful we don’t have any vegans or all hell would break loose, lol. Just kidding. It’s going to be terrific fun! I don’t know how many more holidays we’ll have with my dad so we’re going all out with the traditional stuff which is what he loves, and he’s really looking forward to it. I did make sure, though, to get myself a growler of my favorite locally-brewed beer, just in case, lol. And we’ll be playing Cards Against Humanity after dinner which is always a hoot. 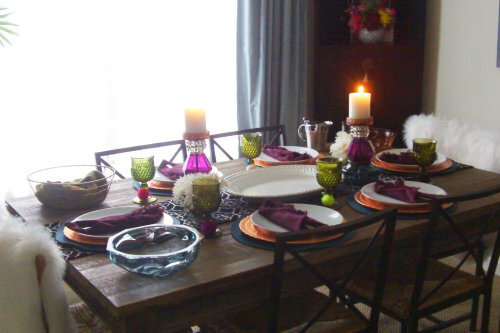 Today, I did a dry run of my table setting (that’s it in the photo). I’m not a fan of the usual orange and gold fall color theme. I went with rich jewel tones instead: purple and plum, shiny copper, avocado green diamond-cut crystal, smokey blue glass. I’ve got chafing dishes set up on the buffet so we can keep the serving bowls on the table to a minimum and keep things warmed at the same time. 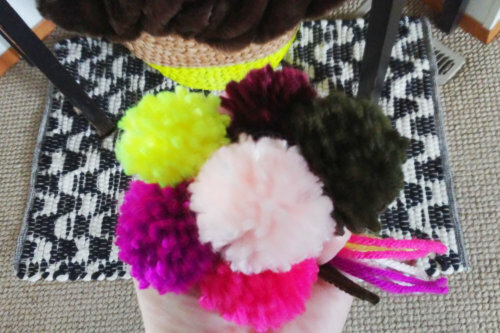 I also figured out the perfect use for all the bright-colored little pompoms I love to make: glass tags! I tied a different color on each glass so everyone knows which one is theirs. In all honesty, other than being the hostess with the mostest, I don’t have to do a whole lot this year except make the mashed potatoes and eat. Ha! My daughter’s boyfriend is making the turkey (he’s a fantastic cook) and everyone else is bringing the rest of the trimmings, sides and desserts. Cheers to that! I wish you and your family a lovely and yummy day filled with tons of love and laughs. And I want to thank you so much for being a part of the Administrative Consultants Association and allowing me to play some positive role in your business journey. I hope I’ve been helpful to you. Please note: Codes expire Nov. 26 so you’ll just want to be sure to use them by then. If you are celebrating, have a wonderful and blessed Thanksgiving! What do you think? Leave a comment! Posted in Personal Musings. Bookmark the permalink.